Swimbaits like the Storm WildEye Swim Shad and the Berkley PowerBait Flatback Shad are among the best tools to arrive on the fishing scene in all my years in the business. But picking up a 5-inch or 6-inch swimbait is for most walleye anglers a step across a great divide — like stepping into an alternative reality. They've been brainwashed by the walleye world the way it is — and long has been — mostly dependent on livebait, always choosing smaller instead of larger, and usually fishing slowly. Fish can only respond to what you show them. That is, walleyes like what they tell us they like in response to our presentation picks — and they don't have a chance to tell us they like aggressive options if we rely only on tiptoe tactics. My approach usually is to start fishing more aggressively and then temper back if necessary. What usually happens, though, is that anglers start off fishing tiny things slowly and when they don't get bit, they further assume the fish are really off and temper back even more. In many situations you have to pick up something much bigger and bolder and fish it much more aggressively. 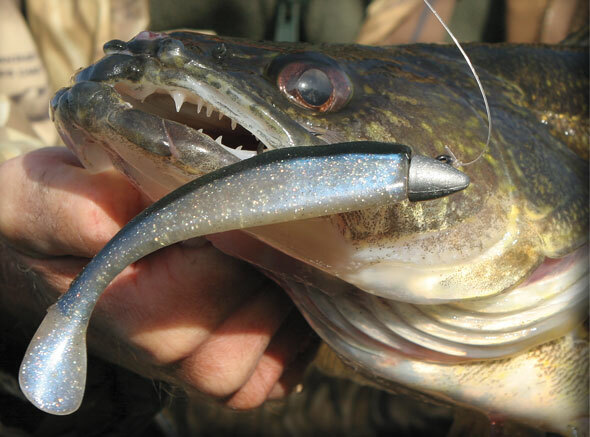 And if you do that, walleyes often — yes, often — respond like the aggressive predators they can be. Berkley PowerBait Flatback Shad — This is new freshwater version of the saltwater Swim Shad that I've fished for many years. I've caught thousands of walleyes on this 5-inch body, several dozen from 10 to 12 pounds and two right at 13. I've fished it from the Bay of Quinte and Henderson Harbor in the East to the Columbia River out West; all across Canada — Saskatchewan, Manitoba, and Ontario; and on at least 30 different waters in the U.S., ranging from Devils Lake, North Dakota, to Red Willow, Nebraska, to lakes Erie and Ontario; as well as on other natural lakes, rivers, and reservoirs, large and small. My two favorite colors are Pearl Blue Back and Senorita, but Herring or Rainbow also work well on many waters. The jighead I've long used is the Owner Ultra Head Saltwater Bullet. You need 1/2-, 3/4-, and a few 1-ounce heads. I often order them online from Owner at ownerhooks.com. Kalin also makes a similar jighead, although I haven't fished with it. Other jigheads work so long as they have a longer hook shank and the hook isn't so soft that it bends under pressure with no-stretch superlines. The 3/8-ounce Northland Slurpie Jig works with 4-inch and smaller-profile 5-inch swimbaits like the Northland Slurpies Rock-R-Minnow. Big Hammer also makes a good head for plastic bodies like their own and the Flatback Shad. I often catch more than 10 fish per soft body, so Flatback is a durable and economical choice. I rig them traditionally to begin, with the back of the lure up and the belly down. Then, when they get so chewed and torn that they won't stay in place on the jighead on a cast, I turn them and fish them flat — that is, with the hook point exposed through the middle of the side of the bait, instead of up through the back. They fish as superbly flat as they do with the back up. They fish a little shallower when you fish them flat, so if I'm fishing in water less than 7 feet deep, in conjunction with the 1/2-ounce head — I usually fish the body flat. All the various swimbait bodies I mention here fish well flat. It's a good idea to glue the softbait to the jighead to begin, although it isn't necessary in this case if you're using the Owner head. The Flatback is only available in 5 inches — overall, the most versatile size. Big Hammers — They're a top-notch swimbait option in the same basic design as the Flatback Shad, but available in 3-, 4-, 5-, 51â„2-, and 61â„2-inch models and about 50 color options. A few favorite colors are Wooky Wacker, Sardine (the counterpart of Berkley's SeÃ±orita), and White Zombie. I've used the 5- and 51â„2-inch models with great success. Big Hammers are molded with a softer plastic than the Flat Shads so they tear more easily. They should be glued to the jighead to increase their longevity. Lunker City Shakers — This is a thinner body design that fishes best rigged flat — available in 31â„4-, 41â„2-, and 6-inch sizes and I often trim back the 6-inch size by about a half an inch and fish that. The 6-inch option is the swimbait body that I've long used to dress J-mac jigs for pike and muskies, catching a lot of big walleyes in the process. Here again, the color lineup is inspired. I've caught a ton of fish over the years on Rainbow. They recently introduced another top option in the 5-inch Swimfish. Berkley Hollow Belly Swimbait — This is Berkley swimbait in the hollow-body design popular among bass anglers. At least a dozen companies have lures that fall into this general category. They're designed to be fished on a weighted wide-gap hook, but they fish much better when depth is controlled with a jighead. The Hollow Belly is available in 4, 5, and 6 inches. Because of their hollow design and thin body wall, care has to be taken to run the jig hook just through the thin skin — either on the back, if you're going to fish the jig in traditional fashion, or through the side, if you're going to fish it flat. At that point, the head needs to be glued to the back of the jighead in order to stay in place to fish effectively. These baits fish smaller than their listed length because of their small profile, so I use the 5- and 6-inch models. They are much more fragile and expensive than, say, a PowerBait Flat Shad, but attractive to walleyes because they're so realistic. Yum Money Minnow — An attractive hollow-body design in 31â„2, 5, and 61â„2 inches, but more sturdily constructed than the Hollow Belly. I can usually catch 5 or 6 fish — often more — on one body. The 61â„2-inch body is too big during early season, but walleyes don't have any trouble with it later on. The Money Minnow also fishes a little smaller than the listed length because of its smaller profile. The head of the softbait should be glued to the jighead, although the Money Minnow's head has a lot of holding power on its own because of its meaty construction. Storm WildEye Swim Shad — The first really popular premolded swimbait remains arguably the best. It has one of the most unique and appealing swimming motions of all the premolded baits — swimming along, wobbling, but as the body swims it also hitches or stutters left and then right, as the tail thumps back and forth. It's also one of the most affordable swimbait options on the market and it's durable, to boot — available in inch increments from 2 through 6 , with the 5- and 6-inch models being most appealing to walleyes. The biggest drawback with premolded swimbaits is that they have one jighead weight per body length, so they must be fished at a general given depth-range per body size. The 6-inch WildEye, which weighs 7/8 ounce, is deadly on walleyes, but it's difficult to fish shallower than about 8 to 10 feet. It fishes well down to about 25 feet. I've caught a lot of walleyes, including fish surpassing 11 pounds, on the 6-inch lure. The 5-inch size works fine, but don't be afraid to fish the 6 incher. Other Options — The options I've mentioned are the ones I've spent the most time with. Berkley and many other companies offer premolded swimbait options, often in their saltwater lineups. Storm also has many other premolded models besides the WildEye. I mentioned that many companies have hollow-body swimbaits besides the two I've fished. Northland offers the Slurpies Rock-R-Minnow, which has a realistic but thin profile. I'd fish it rigged flat. Storm has a unique hollow-body option in their WildEye Pro Paddle Tail, which couples with a Bait-N-Switch Jig Head system. The 41â„2-inch and 51â„2-inch Paddle Tails fish well with the 3/8-ounce head. I use 14-pound Berkley FireLine Crystal or Sufix Fuse, in combination with jigheads weighing 1/2, 3/4, and 1 ounce, fishing depths from 4 to 25 feet. The 14-pound has a breaking strength of about 30 pounds. I also usually have a rod rigged with 10-pound FireLine for fishing shallow with a 1/2-ounce jighead. And if I want to probe water deeper than about 25 feet, I use 10-pound FireLine in conjunction with a 1-ounce head. That combo fishes well down to 50 feet or so and still keeps a swimbait moving along at a speed that's attractive to walleyes. The 10-pound line probably has a breaking strength of about 20 pounds. I add a 4-foot section of 15- or 20-pound fluorocarbon on the end of the 14-pound FireLine, except when I'm fishing waters with pike or muskies. Then I also add a 15-inch section of 20-pound American Fishing Wire Micro Supreme to connect to the swimbait. I haven't had any indication that walleyes are wary of wire in situations where you're moving a lure along steadily and relatively quickly. The FireLine-to-fluorocarbon and fluoro-to-wire connections are made with back-to-back four-wrap uni-knots. In darker water I might tie the FireLine direct to the wire. If you're making hard casts to get distance and catching a fair number of fish, you should retie the line and leader connections several times a day. A good place to learn about tying knots is the website, marinews.com. My rigging with 10-pound FireLine includes a 15-pound fluoro leader and a 15-inch section of 13-pound-test wire. The 10-pound line is so thin that it should be doubled before making the connection to the fluorocarbon. I usually tie a one-handed Bimini Twist, but a Spider Hitch works just as well. In a pinch you can use a three-wrap overhand knot. A favorite overall rod-and-reel combination, for me, has been the Fenwick Elite Tech Bass Jerkin Rod, coupled with a 30-size Pflueger Supreme reel (8030MG). The rod's 7 feet long and has a medium-fast action and medium power. For a 10-pound setup and fishing a 1/2-ounce jig, I might use a slightly lighter rod. All the companies that produce rods and reels have similar combinations, but don't over do it — the rod needs some give (bend) in order to work well with FireLine. Seven feet is just right, although I could see going to 7 foot 6 inches in some situations, where even longer casts might be required. One advantages to using a swimbait is the ability to cover a lot of water. In order to be effective, the lure needs to be moved along so that it displays its best characteristics — that's the combination of the profile of the lure wobbling along and thumping as it literally swims through the water column. So, instead of tip-tipping the lure along the bottom, a swimbait needs to move along steadily for 5, 10, 15 feet, hesitate momentarily, and then move along again. At times, of course, you might want to fish the lure right along the bottom. That means stopping the lure and letting it sink to reestablish bottom contact. Some anglers also fish this lure vertically, dropping it right down to fish they see on their electronics and lifting it two feet and letting if fall back a foot. The fish hit once the lure pauses after the fall. The no-stretch of FireLine and Fuse allow you to fish through weedgrowth by snapping through on contact. This works until soft weeds like eelgrass predominate, or stiffer weeds begin to fall over and create tangles. Fish also often eat these lures with a bit of weedgrowth hanging on the lure. And, when you have a few weeds on the lure after a cast, don't waste time picking them off, just make another snap cast and most of the time the weeds are left behind and you can start a clean retrieve. Anywhere walleyes swim you can catch them with swimbaits, but they aren't always the best option in some situation for some anglers. Trolling in open water such as on portions of the Great Lakes summer and fall, walleyes love swimbaits but it's difficult to maintain a certain depth with them than with diving crankbaits. Too, anglers not adept at counting the lure down and keeping it at depth have a hard time fishing it over shallow rocks. They get hung up more than they might with crankbaits. But walleyes love swimbaits just about anytime they're shallow. As I said at the beginning, swimbaits are among the most remarkable tools to arrive on the fishing scene in all my years in the business. They should be part of any walleye angler's stock of lures, as core as crankbaits. As fundamental as spinner rigging — as basic as any kind of livebait rigging. They also tend to get the big bite, meaning they often trigger bigger fish — but not at the expense of getting smaller fish to bite. Of course they don't work all the time — they certainly aren't magic; but often enough they're special in their ability to turn walleyes into eating machines. And beyond that, pike, stripers, wipers, muskies, largemouths, smallmouths, and flathead catfish also like them.